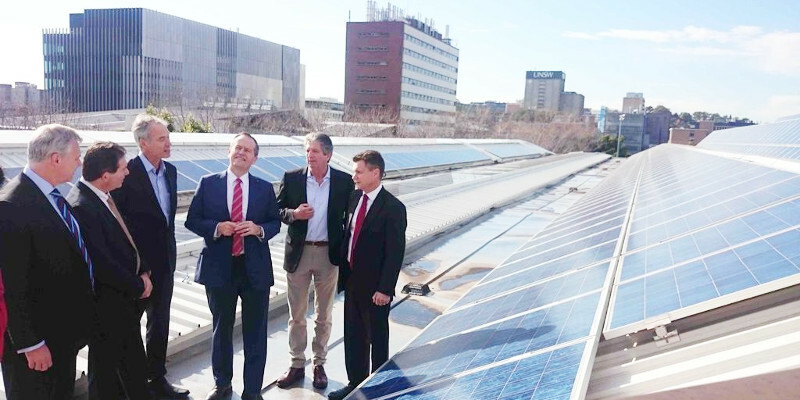 Mr Shorten views UNSW’s rooftop solar panels with UNSW Engineering Dean Mark Hoffman, President and Vice-Chancellor Ian Jacobs, Professor Stuart Wenham, Professor Martin Green and Labor member Matt Thistlethwaite. Photo: Robert Largent. Labor Opposition leader Bill Shorten’s advocacy of a 50 per cent renewables target at Labor’s National conference in Melbourne has effectively made action on climate change a policy point of difference from the Abbott government for the next election. But the target has been assessed as the bare minimum renewables target for staying on a decarbonisation path of limiting global warming to 2 degrees as agreed by the United Nations. On thursday Bill Shorten visited the University of New South Wales inspecting the world class solar research facilities, where several significant breakthroughs in solar technology have been made, including the first photovoltaic system to achieve over 20 per cent efficiency in 1989, and the most recent achievement of a 40 per cent solar cell efficiency for converting sunlight to electricity. Shorten reiterated that Australia could easily reach the 50 per cent renewables target based on local innovation and research. “We have the best solar researchers in the world … We have so much sunlight, so much wind power in this country, we would be literally crazy not to pursue more ambitious goals for renewable energy. The rest of the world is not waiting … the rest of the world is already setting [those] ambitious goals,” he said according to a University media release. Anna Skarbeck from ClimateWorks Australia and Frank Jotzo, the director of ANU’s Crawford School Centre for Climate Economics and Policy, have outlined the feasability of a 50 per cent renewables target and assessed that the costs would be minimal. They also strongly noted that 50 per cent renewables by 2030 is really the bare minimum to keep Australia on the path to reducing emissions so that we do not contribute to exceeding 2 degrees Celsius warming limit agreed to by Australia at United Nations Climate meetings. 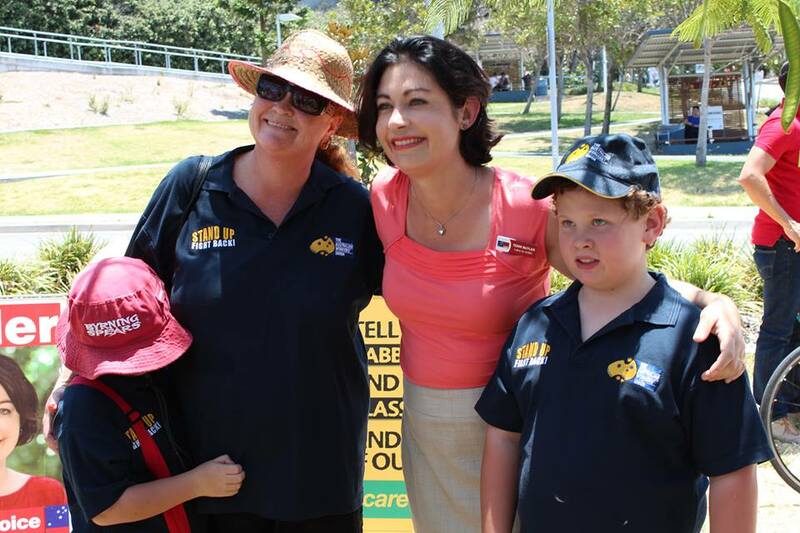 The Greens, in comparison to the ALP, have a policy target of 90 per cent renewables by 2030. You can read more about deep decarbonisation pathways for Australia. State Labor Government’s are already acting on renewable energy. In May Queensland’s new Labor Energy Minister Mark Bailey announced pland to generate 50 percent of the state’s electricity from renewable energy by 2030, and to increase solar rooftop numbers from 400,000 to one million homes by 2020. South Australia adopted a 50 per cent target by 2025 and is already well on the road to achieving the target producing about 40 percent currently. The new Labor Government in Victoria lead by Premier Dan Andrews also is considering a substantial renewable energy target. With the three state Labor Government’s setting substantial renewable energy targets and the ACT target of 90 per cent renewables by 2020, there is no reason why a similar Federal target could not be effectively implemented without undue cost. Likewise overseas. Germany already has a 50 per cent renewables target by 2030 under their Energiewende (Energy Transition) program, and Half of Europe’s electricity is set to be from renewables by 2030 according to The Guardian. The United States is already moving to expand renewables with President Obama setting a 20 per cent target by 2020. California Governor Jerry Brown announced in January that California targets 50 per cent renewables by 2030. Hilary Clinton, in her democratic campaign for the 2016 US presidential race, announced two ambitious renewable energy goals which will result in expanding the amount of installed solar capacity to 140 gigawatts by the end of 2020, a 700 per cent increase from current levels, and 33 per cent renewables as part of US power generation by the end of ten years after she takes office. Labor Leader Bill Shorten sees the global energy trends with regard to renewables and the popularity of renewables among the Australian population, and that the Abbott Government campaigns to reduce the RET, close down energy efficiency programs, and engage in a war on renewables is a destructive abberration out of synch with public opinion and global trends. said Shorten at Labor’s national conference in Melbourne. It was telling that Shorten’s motion for a policy of Australia generating 50 per cent of electricity from renewables by 2030 was seconded by the Secretary of the mining union, the CFMEU, Tony Maher. The largest mining union, the CFMEU, can see the writing on the wall. They went through the poorly planned privatisation of electricity in the La Trobe Valley which devastated the community socially and saw massive reduction in employment. The privatisation of the sector in the 1990s was overseen and implemented by the Kennett State Liberal Government resulting in a social disaster for the La Trobe Valley communities. As I argued in in my June 2015 article: Latrobe Valley: Finding Hope in Morwell at climate ground zero, transition planning for phasing out domestic thermal coal industry is essential to ensure that workers and communities are part of and assisted in this transformation. 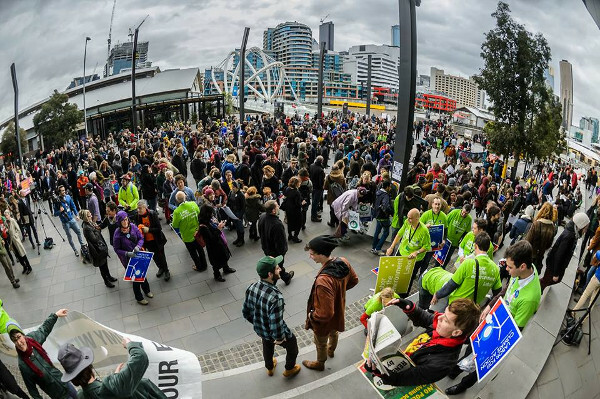 Outside the conference a rally with a couple of thousand people urged the adoption of a strong renewable energy target. 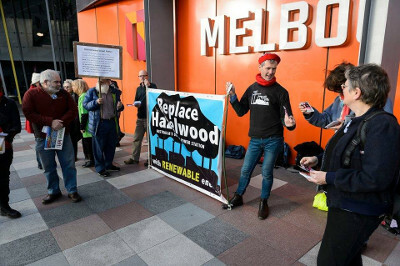 A smaller collection of Climate Activists, including from Climate Action Moreland, gathered in the early morning as delegates entered and called upon delegates to consider the necessity for closing down some of the redundant coal fired power stations like Hazelwood, instead of allowing them to continue operating and perhaps even claiming credits under the RET for burning forest waste in addition to brown coal. Fitzgibbon has today confirmed Labor will return to a carbon tax. The #ALPConf2015 yesterday confirmed it would be the world's largest. 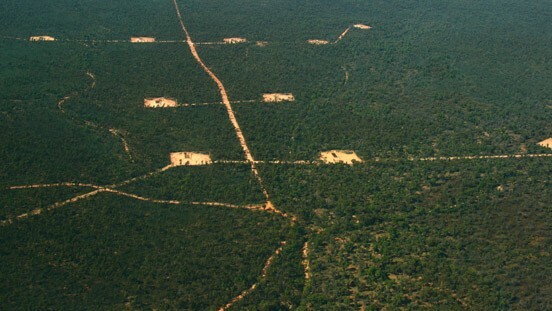 But then Greg Hunt is full of policy hypocrisy when it comes to advocating a carbon tax or Emmission Trading Schemes. Yet the Abbott Government, like their state counterparts, have no transition plan to speak of to manage the impact of transitional change in the coal mining and power generation sector, let alone the domestic auto industry which is the process of closing down due to Abbott government decisions. In a doorstop interview on Monday he told reporters this may cost $60 billion or more and said Labor’s ETS scheme “might as well be called an electricity tax scam”. A factcheck by the Conversation website also found the Prime Minister’s statement on $60 billion claim misleading. But these scare tactics don’t hold too much weight with the public. Recent opinion poll surveying revealed that the public thought the carbon tax had minimal impact on electricity prices, and that Tony Abbott’s promise of an electricity bill price reduction of about $550 annual price reduction appears to have not washed with voters experience. Or you could believe Tony Abbott from 2009 who denied climate change as settled and succinctly made the case in an interview for a ‘simple carbon tax’. And with climate change everything changes, whether we like it or not. Lead Image by University of NSW Media centre. 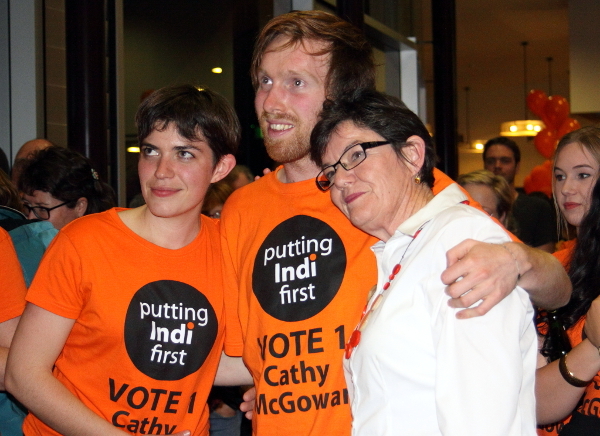 Images outside the ALP National Conference by Sally Newell.